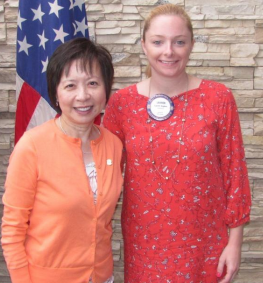 Last week Marc Lebowitz introduced Jeannie Tsakamoto from the Madison Rotary Club. She is in charge of membership in our district. Everyone in the club is responsible for increasing membership. The number one reason for joining Rotary is because someone asked them. We all know somebody; neighbors, co-workers, kids, grandkids, people you see at sporting events… Why not make Rotary part of your conversation? You do not have to ask the person to join Rotary. You just need to start a conversation and invite them to a meeting. Let them experience what Rotary is all about. You can invite them to a club service project. Let them experience hands-on, humanitarian service effort. You can invite them to a club social event. The district leadership committee can help clubs. On the new district website, njrotary.org, there is a resource section with membership information. Next Rotary year (2019-2020) membership will be Rotary International’s top priority. We are at a very critical point. In North America, membership has been going in the wrong direction. If we don’t work on membership, we will no longer have the resources to do what we want to do here at home and around the globe. Jeannie hopes that clubs will make membership a top priority as well. Whatever the goal is for the club, the club needs to bring in more people due to natural attrition (club members transfer, moving). Perhaps the club needs to bring in twice as many members to meet their goal. If each member brings in someone to visit the club and gets them interested in Rotary, maybe half will join. Think about what is going on in the club. One of the things you must do to grow membership is to understand your obstacles. Why are people leaving? Why are people not joining? What are the goods things in the club that we can continue to do more of? If one method of getting new members is not working, try another method. If joining is too expensive for people, is there something the club can do to change its pricing policy? Is the meeting time not convenient? Can the day or time be changed? Can you have a breakfast and dinner meeting? Based on the answers to the questions above, the membership committee needs to develop a plan. One of the district goals is to boost our public image through newspapers, radio, Facebook, Twitter… Get the word out about the dictionary project, duck race, casino night, scholarships… Always include a photo to grab people’s attention. Let them know what Rotary does. This will help to get people interested in joining Rotary.